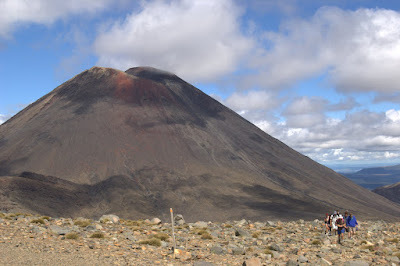 Mount Ngauruhoe is a rocky and barren place upon which your feet will find little purchase. The land surrounding it is a blasted hellscape devoid of much flora or any fauna. All that’s alive here is the earth, as proven by the number of vents gushing steam and shooting crystalline sulfur pellets from its fiery depths. But walk a few miles, and the stench of sulfur will abate. A verdant rain forest will reappear. As nice at is to see signs of life again, it’s the lava-scoured lunar surface that truly makes the Tongariro Alpine Crossing by far the most incredible single-day hike I’ve ever done. 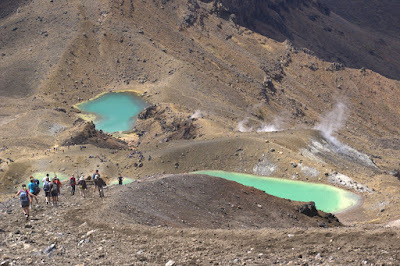 According to most guide books, just hiking the crossing should take 6-8 hours, not including a side-trip up Ngauruhoe, which starred in the Lord of the Rings trilogy as Mt. Doom, the hangout of bad guy Sauron. One look at it, and you’ll understand why it filled the role so well. It adds about three hours to a typical hike along the crossing. 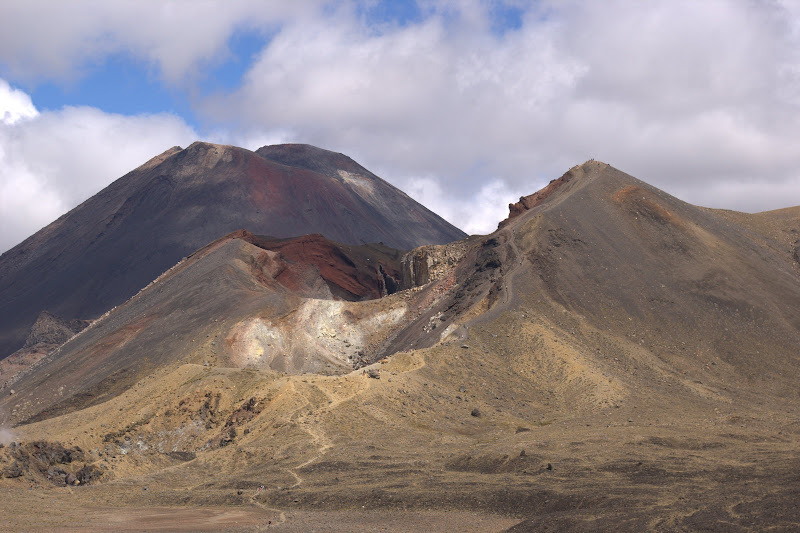 A QUICK TIME LINE – Just remember, Tongariro’s weather is highly variable. This was on a sunny and perfect day without much wind. Hour 1: The hike starts off going between lava flows for Mangatepopo Car Park. You’ll pass dripping springs and a turn-off to one of the huts. Hour 2: You’ll start up The Devil’s Staircase, which is where things start heating up. The reward once you get to the top is choosing whether to climb Ngaurahoe. Just do it! It adds three worthwhile hours. Turn right toward the hulking cone. Veer to the left, following a bunch of big poles in the ground. On the ascent, head toward the large rock outcroppings. You’ll get the best footing. If you veer right, I’ll hope you like calf-deep volcanic cinders and going one step forward and four back. Hour 3: Still climbing. you’ll come to a false summit. You’ve gotta go all the way to the top. Hour 4: You’re up at the top of Mt. Doom! Snap your photos and head down. Pass the big rocks and follow the path past a vent surrounded by pellets of crystalline sulfur. From there, you can kind of “ski” down the slope. Look for a worn brown track. It’s deep enough that, if you fall, you’ll slide just a little way before the cinders drag you to a halt. Hour Five: March across a flat plain between Ngauruhoe that’s emitting steam from unseen holes. It’s startling and unearthly. At the end of the valley, you’ll find a shorter slog up to Red Crater. Hour Six: From Red Crater, you’re onto Emerald Lakes, Central Crater and Blue Lake. There’s actually a small colony of gulls at Blue Lake, the first sign of animal life that I saw that day. 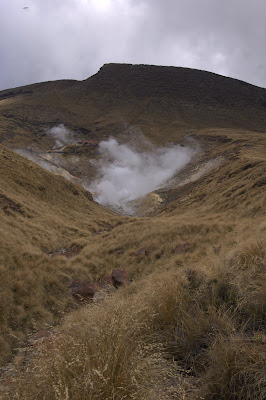 Hour 7: From Blue Lake, you’ll descend past more steam vents to Ketatahi Hut. Stop there and refill your water, if needed. Hour 8: On to Ketatahi Car Park. You’ll finally get in under some vegetation. This part of the walk seems to take a long time: You’re at least in the shade finally, but you can’t really see the end. Rest assured, it’s coming! Get to the car park, hop your bus and return to Whakapapa. We started our trip at the north end at about 7:30 a.m., and we finished just before 4 p.m. As a frame of fitness reference, my latest half-marathon time was 1:57. Sarah’s latest marathon time is 3:59. That should give you an idea of what you might be in for. Okay, onto the practical stuff! 1. 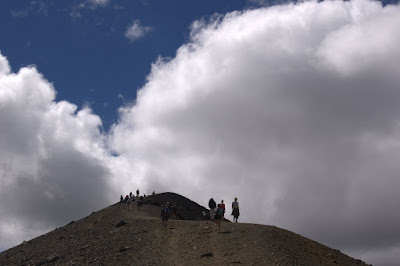 Whakapapa Village is the starting point for most people to launch their hikes. We arrived in the late afternoon from Rotorua, which is two hours away. Our original plan had been to rent a bit of gear like sleeping bags and stock up on supplies. But there’s barely anything to Whakapapa Village: a few hotels, a very small store, a visitors center and the ski lift further up. Stop in Taupo, a much larger town, to stock up on supplies – especially food and hiking snacks. 2. Dress in layers. I wore a pair of REI convertible quick-dry pants, a long-sleeve Nike base layer, a Prana t-shirt and an REI jacket, which I took off while climbing up The Devil’s Staircase. On the feet, I had Smartwool socks and a pair of La Sportiva Trango Trek boots. I love those boots like a lifelong friend. I also had a backpack carrying 120 ounces of water and a bunch of Hamish Carter One Square Meal bars, which is all I could find at the little Whakapapa store. 3. Bring a camera or you’ll kick yourself. 4. Try to get an early start to avoid the worst of the crowds. Even if people aren’t hiking the full crossing, a lot of people are out there. It’s still wonderful, regardless of the crowds. 5. Even if you drive yourself to the park, most locals insist cars are susceptible to break-ins at the trailheads. Most suggest booking a spot with one of the local bus companies from Whakapapa. I wasn’t willing to risk it, and considered about $25 NZ per person a good investment. 6. On the way up, wear gloves! I used gardening gloves, but a pair of Mechanix gloves would’ve been better. Put them on the second you decide to climb Ngauruhoe, and your hands will thank you. Bravo. We are turning towards Glaciers perhaps this Easters.